The team included Kile, Lipscomb; Megan McClelland and Megan MacDonald of the OSU College of Public Health and Human Sciences; Kim Anderson of the OSU College of Agricultural Sciences; and Andres Cardenas of the Harvard T.H. Chan School of Public Health and an OSU doctoral graduate. The research was supported by OSU’s Hallie E. Ford Center for Healthy Children and Families and the Environmental Health Science Center at OSU. The wristbands, developed by Anderson at OSU, have a porous surface that mimics a cell, absorbing chemicals that people are exposed to through their environment. When the wristbands are returned, Anderson can screen for up to 1,200 chemicals that may accumulate. 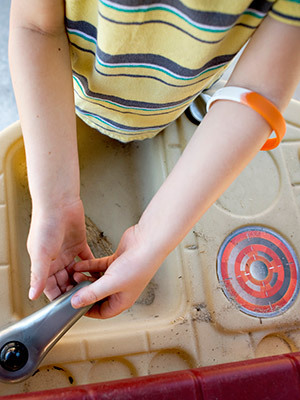 The wristband is an easy and non-invasive way to sample children’s chemical exposure. “The results of this research to date have shown potential impacts for child health and warrant a more thorough investigation,” Kile said.